The new Sharp terminal is bound to be popular with the same crowd who lined-up to get Willcom’s Zero3 model, also made by Sharp, in late 2005. 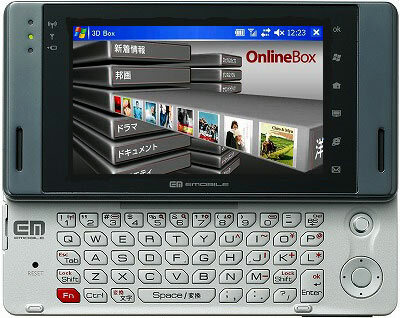 The EM-One is a touch-screen qwerty-keyboard dual-slider device sporting a 4-inch LCD screen with Japan’s first WVGA (800×480)-resolution screen and Windows Mobile 5.0 (with all the typical office functions). At only 18mm thin, it even comes ready to watch 1Seg digital TV broadcasts and – according to the specs – the unit sports a Marvell PXA270 cpu running at 520MHz with 512MB of Flash memory and 128MB RAM. Perhaps most interesting are the rather agressive price plans, which bundle the device with fixed- and mobile-broadband connection services to attract new customers. The company also announced four new data cards including a PC Card unit produced by NEC and a USB design coming from Huawei, which will run on the same high-speed network and tabehoudai all-you-can-eat billing model. The new services will be available starting 31 March in five major population areas including Tokyo, Aichi, Osaka and Kyoto. More details after the jump. While there is a fair bit of material to wade through, a couple of points stand out for starters. First, the company has secured a great-looking device from Sharp and has ensured the line-up includes very affordable data cards for the lap-top and PDA crowd. Service contact rates are quoted at approximately JPY40,000 for the smartphone with a JPY6,000 flat-rate monthly data plan (JPY5,000 on a long-term option), while a data card will run new subscribers JPY5,000 to get underway. Second, they are really pushing the FMC (fixed-mobile convergence) model with an aggressive bundled price campaign and by combining eAccess DSL service. This initial strategy is certain to attract current PHS Air-Edge (from Willcom) customers who are paying about the same rate for perhaps 10 percent of the connection speed. One other note of interest was the slick 3D browser by Yappa; it would seem Apple are not the only ones with grand UI designs! eMobile (and IPmobile – who we also expect to make a debut announcement soon) have a rather narrow window to attract their target demographic as the major players are increasingly looking at the business segment as a new growth area. But the Big Three cellcos obviously have decent bandwidth available – not to mention great, long-standing device maker relationships – to counter these moves. DoCoMo, for example, could certainly offer their HSDPA card with the same package price while KDDI’s new EV-DO network opened late last year and, after all, they were the original pioneer of mobile flat rate in Japan. As predicted, the entry of these new start-ups will certainly drive price competition and innovation, which of course is always good for the customer! WWJ wishes them all the best of luck – and we will continue watching (on your behalf) as this story develops. For more details with, product photos, see the links below and Chief Editor Daniel Scuka’s ViewPoint article from November 2005 is also worth a reread.